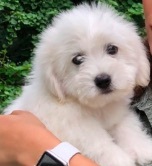 I am going to bring home my new Coton puppy home in a week and I am very nervous. I have been watching lots of youtube videos on puppy training, but I am still nervous and feel like I don't know what to do to have a good start with my puppy. Any advice? I am going to be home most of the time at least for the first month when I bring him home, but I am wondering if there is any way to prevent separation anxiety before it develops? I would appreciate any advice! Comments for New puppy - I'm nervous! Congrats on your family's new addition. Give your new friend lots of love and encouragement. Also, you might consider doing some natural stress relieving. It can be something as simple as breathing deeply for a few seconds and reciting a positive affirmation. "I'm doing fine. My puppy is doing fine. Everything is working out okay." You can look at something called Rescue Remedy, too. This is a natural remedy made from flowers. When my second born son was around, I always had a bottle on hand. Just a couple of drops in water, sip one sip and you can relax. Also, consider watching some more dog training videos on how to train puppies. Give positive reinforcement ONLY when the pup behaves correctly. Never say "NO" when he/she does something you dislike. Find situations where you can say YES to your puppy. Reward yourself verbally each time you notice you are feeling calm about being with your pup. Expect your "baby" to be in a learning curve for a while. When you expect there will be accidents in the house, you won't be disappointed. Remember to take him/her outside A LOT to poo and pee. Make a big deal out of him/her "going" in the right place. Also, remember to invest in poo bags. That way no one, not even the neighbors, will step in your baby's poo. Keep us posted on how you are doing. Believe in yourself and in your ability to think positively. By believing in what is possible, you'll naturally relax and do well. Congratulations - how exciting. The best advice is for you to relax. Cotons are super smart and sensitive and will pick up on your anxiety. So don't expect perfection - puppies have accidents and will misbehave - it's all part of the learning process. For separation anxiety, get your pup socialized to all kinds of people and activities and don't show your stress when leaving. Do a search on this site for separation anxiety and you'll find all kinds of helpful tips. Enjoy your new pup and let us know how it goes.